Sleeveless, full zip, forest green vest. 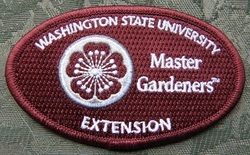 Add a Master Gardener logo patch (below). Custom embroidered oval shaped emblem to customize your MG apparel. Sew or iron it on a hat or a sweatshirt to show your colors.